The Electrical Safety Foundation states that on average, there are about 4,000 accidents with injuries every year and another 300 deaths all resulting from electrical hazards. OSHA’s electrical occupational hazard standards seek to minimize potential electric shocks, electrocutions, explosions, burns, fires and more by regulating the design and use of electrical systems and equipment. Here are some examples of what could happen to the workers depending on the voltage of the electric shock. 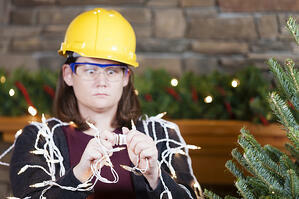 Many electrical accidents can be prevented through proper training, but simply training employees is not enough. You must also implement effective safety measures, such as lockout/tagout procedures, to protect your employees. Be sure to have a planned process for every job as part of your safety program. Every worker should be familiar with every aspect of the safety procedures for their jobs. After assuring no personnel are exposed, attempt activation of all normal operating controls (e.g., push control buttons, etc.) to make certain the locked out equipment does not operate. A strong safety training and management program can help your company achieve a near zero injury rate. You can learn more information about safety training and safety awareness by downloading our safety manager’s guide to safety training.